↱ Kenwood TM-255A transceiver delivers superior performance and all-mode operation in a mobile-sized package. Packed with all of the most often needed features such as: auto mode selection, dual digital VFO's, all mode squelch, programmable scanning functions, semi break-in with side tone and much more. ↳ This compact, lightweight unit is just the ticket for the VHF operator needing a smaller sized rig in the shack or wanting to operate multi-mode mobile or portable. Output is 5 watts Low and 40 watts High. The TM-255A has a detachable front panel (requires optional cable) for easy mounting in a car. ↪ Other features include: fly-wheel VFO tuning knob, 101 memory channels, 1200/9600 Packet jack and DDS with "fuzzy logic" control. The rear panel has a single SO-239 jack. With hand-mic. 7.0 x 2.4 x 8.5 inches (180 x 60 x 215.5 mm). 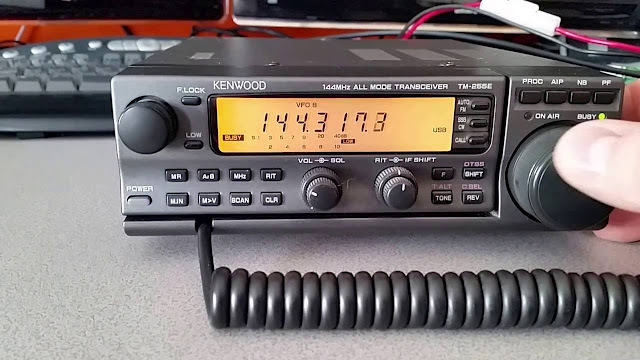 The Kenwood TM-455A is similar, but operating on the 70 cm band (440 MHz) instead of 2 meters.